The strain gauge operates on the principle that a tensioned wire, when plucked, vibrates at its resonant frequency. The square of this frequency is proportional to the strain in the wire. 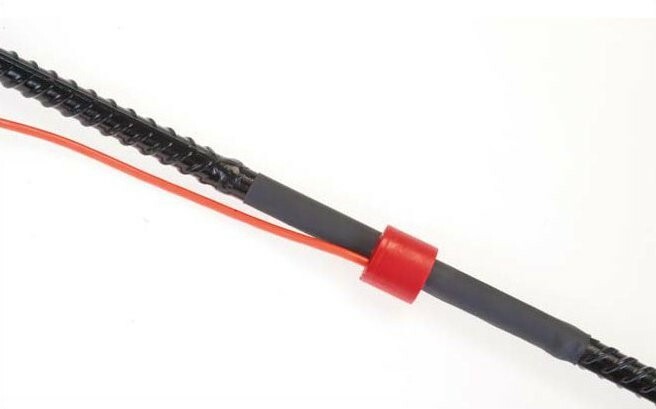 The gauge consists of two end ribbed rebar with a tensioned steel wire between them. Around the wire is a magnetic coil which when pulsed by a vibrating readout or data logger interface plucks the wire and measures the resultant resonant frequency of vibration. Deformation within the concrete will cause the end bars to move relative to each other. The tension in the wire between the bars will change accordingly thus altering the resonant frequency of the wire. The coil units and cable connection are encapsulated with a proprietary rigid epoxy resin to keep the gauge de-bonded from the concrete. This strain gauge is designed for monitoring strain in steel structures or strain in concrete or masonry surfaces. These include built-in thermistor or RTD. The strain gauge is screwed onto mounting plates, which are welded, screwed, or bonded to the structure. Because there are a wide variety of surfaces to which the gauge can be attached, two types of mounting plates are available, one for steel and one for concrete. 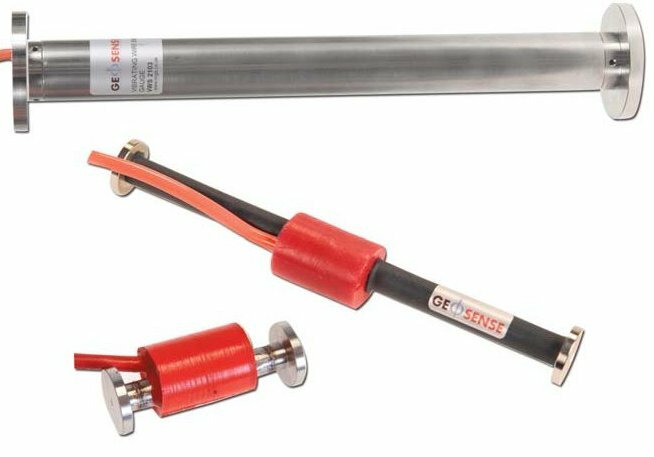 The embeddable strain gauges are ideal for measuring the internal strains in concrete, whether this is cause by shrinkage of the concrete itself, or the relative motion of the reinforcing. In reinforced or pre-stressed concrete, the strain gauge is usually tied to the reinforcing cage, as shown above. Some specifications require that the gauge be cast in a concrete briquette prior to installation. In mass concrete applications, the gauge may be installed either before or immediately after placement of the concrete. Spot weld vibrating wire strain gauges are designed primarily to measure strains on the surface of steel structures but may also be used on other types of material. Geosense® VWS-4000 series vibrating wire Rebar Strain Meters (often known as ‘sister bars’) are designed to be embedded in concrete to measure strains due to imposed loads in mass concrete. Monitoring joints for unexpected movement to provide early warning of performance problems. Monitor joints and cracks in structures that may be affected by nearby excavation and construction activities. Monitor cracks in structures that experienced seismic activity.